LCV founder member Colin McLean sadly died earlier this year. Volunteers and others who knew Colin share their memories of him. For almost all LCV members who know Bawsinch as it is now, it is hard to imagine that forty years ago the whole reserve was little more than an overgrown rubbish dump. The transformation of the area since 1971 - when the Scottish Wildlife Trust (SWT) purchased Bawsinch - has been the result of a great deal of hard work, not least by LCV members. However one individual stands out in particular: Colin McLean. 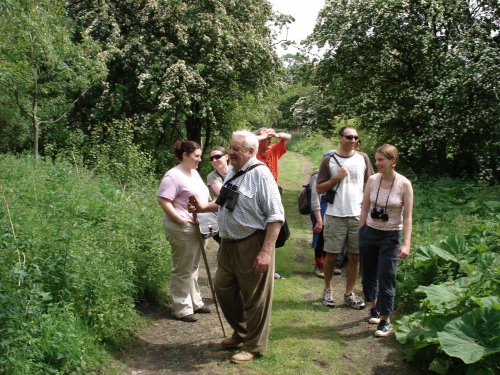 While the news of his recent death, aged ninety-one, is very sad, it is perhaps softened by the knowledge that he has left a great legacy, foremost at Bawsinch and Duddingston Loch, but also at many other Scottish Wildlife Trust nature reserves in the Lothians. Colin developed his love of wildlife as a child, reinforced during his army service in WWII when he recalled one of the few brighter moments as listening to the dawn chorus of gibbons in the Burmese jungle. After the war, his choice of a career with the Forestry Commission was also influenced by his interest in wildlife and this coincidentally led to his joining SWT in 1969, when the Trust had a stand at an exhibition at Bush estate where he worked. Forgetting the old army maxim of 'never volunteer', he joined an LCV work party in 1972 at the newly purchased Bawsinch reserve. He obviously showed some talent because by November of the same year he had been co-opted onto the reserve committee. In 1976 he became convenor of the reserve committee and he served continuously in that position for thirty-four years until he decided to retire aged eighty-nine. Naturally, at such a young age, he did not retire completely and remained an active member of the committee and was still regularly attending meetings this year. The transformation of Bawsinch has included major excavations for numerous ponds and the creation of a flower meadow. 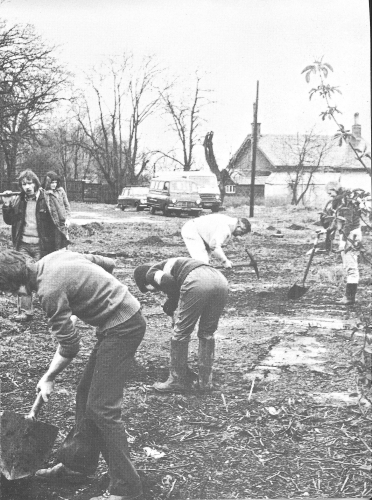 In Duddingston Sanctuary Colin organised a major scheme in the 1980s to clear a series of channels through the reedbed to the west of Duddingston Loch using a floating dredger. However, perhaps his most distinctive achievement, reflecting his forestry interest and expertise, is the creation of a new woodland, following proposals developed by the Edinburgh University Forestry Department. The wood is a 3.5 ha area of Bawsinch described at the time of its acquisition by the Trust as being "rubbish and willowherb" . The wood is now a maturing collection of all species of trees and most shrubs known to be native to Scotland along with smaller groups of many of the woody species native to Britain. These have all been sourced and planted under Colin's supervision and include groups of Scots pine grown from seed taken from almost every known native pinewood in Scotland. However Colin's contribution to the Trust was much more wide ranging than Bawsinch. He was recruited onto the Lothian Branch - later Lothians Members Centre - committee in 1974 and he served continuously after that in a variety of roles, including a term as Chairman and Lothian representative on the SWT Council. He always passionately believed in the importance of acquiring land for nature reserves - almost any land including overgrown rubbish dumps! - and was closely involved in the acquisition and management of many current SWT Lothian nature reserves. A quick tally includes Addiewell, Roslin Glen, Linn Dean, Woodhall Dean, Linhouse Glen, Bathgate Lagoons, Tailend Moss and Pease Dean - actually in the Borders region. At Addiewell, Colin was also Convenor until retiring in 2010 and again made great use of LCV in developing the reserve. I now have the privilege of continuing Colin's work as his successor at Bawsinch but I have to say that I cannot hope to match his length of service or indeed match his vast contribution to the development of the Bawsinch and Duddingston Loch nature reserve. Colin is someone that I am sure all of us will greatly miss - a great character and always great entertainment as well as leaving an immense legacy of work for wildlife conservation, not least for the SWT. I first started doing nature conservation work with Colin around 1984 when I joined the SWT Lothians branch or first went out with LCV on task - probably the latter first. Many fond memories of him are recorded below and more were voiced at the fitting celebration at the Botanics. My own would include seeing him swinging through the trees at Bawsinch with a large axe on his shoulder, and the time he told me of seeing the tigers sleeping around ancient temple ruins in the Burmese jungle when he was a Chindit there. And that is my point: it seems to me - and to many - that they just don't make them like Colin anymore, with his delightful non-PC attitude to conservation and his enthusiasm for just getting on with it which we all loved. Two people have inspired me to continue to volunteer to work for wildlife both in the wider countryside and in particular in urban greenspaces - and I won't embarrass the other one by naming him as he is still very much with us! Colin is one of them and it was his clear, unchanging message over the decades that wildlife needs refuges - real refuges with little disturbance - that has, and continues to, inspire me. Colin is trusting us all to continue this work; to keep and evolve our urban and countryside reserves. And to do it all with whatever scarce resources we can gather. We won't forget Colin. After discussing several options, such as christening the new wildflower meadow on the old Goose Green 'Colin's land', the Bawsinch reserve committee has decided to rename the entire Inch Wood - which after all, Colin planned, planted and nurtured for over thirty years - to 'Colin's Wood' . Colin's death is a great shame as he was a great man: here are some things you may or may not know. He was with the Forestry Commission for many years, and on retirement they presented him with a chainsaw - the SWT's woodlands were never the same again! I also liked his management plan for Roslin Glen. Drawn up in the 1980s it prescribes the planting plan to restore native woodland up to the 2080s. Now that's what I call a plan! Same for Bawsinch - a mission to create a collection of Scotland's native trees. What a resource! We knew Colin whilst living in Edinburgh and active with LCV during the 1980s. He was the stalwart of SWT's Lothians Branch either on the Branch Committee or at meetings for the members. He was also active on tasks at which he oversaw the development of the local reserves that were dear to his heart: Roslin Glen, Erraid Wood and Bawsinch. Once met, forever remembered, Colin was certainly not the sort to get lost in a crowd, and the home-made fruit wines he generously dispensed in the festive season were not readily forgotten either! Although Colin hankered after the names of yesteryear, continuing to call LCV the Conservation Corps long after the headed paper had been used up, many of his approaches to life have resonance today: if you want something doing, find others of like mind and get on with it: the Big Society; be organised and shoulder responsibility in a way that encourages others to follow you: inspirational leadership. He was a tremendous source of experience and advice, and if he could not help you himself he knew somebody else to approach - well networked, so to speak. Colin took a disarmingly simple approach to making progress: draw up a plan, start at the beginning and keep going until you get to the end - leading to escalational banter on task about how Herculean an undertaking he could complete with how puny a tool. Mock though we might, few of us will achieve as much as him. Colin's passing away is a sad loss, but his memory and legacy live on. I first met Colin in 1989 on a task at Bawsinch and it was immediately apparent there was a great deal of mutual respect between him and LCV. He was very supportive of LCV's volunteers and our practical work, and came out on task with us well into his eighties. He was also quite a character. I like to remember the way he very enthusiastically used a bill hook and cross-cut saw to fell trees in a way that was probably not always compliant with Health and Safety regulations. I also remember the day he used a spade to humanely despatch a rabbit that was obviously suffering horribly from myxomatosis. But that was Colin's way, as was the way that, when on task, he was always happy to talk to regular and new volunteers alike, to share his knowledge of trees and conservation and to have a laugh. I also spent time with Colin on the SWT's Lothians Members Centre committee, and saw the sound contribution that he made to its work. He was dedicated to supporting practical conservation projects and always spoke very positively of LCV, raising its profile within the members of that committee. He was also an effective voice on the wider stage of SWT's work, having at times represented the Lothians on SWT Council. When I was Treasurer of the Members Centre (a post that Colin recruited me into) Colin would post me the cheques he had received from members who were renewing Bawsinch hide keys. The cheques were always accompanied by a hand-written note on a card, usually picturing an animal from the African plains such as an antelope or a giraffe, and always including a comment about recent wildlife sightings or the weather - waxwings over Bruntsfield Links were often noted during the winter. The notes were always signed off 'Yours, aye' in Colin's inimitable style. So it's a sad time for all of us but I know that my involvement in conservation has been made richer by having Colin as a great friend, and that is how I'll remember him. On one trip to Addiewell Bing, I chatted with Colin, and found out he had actually fought in the Far East during the Second World War in a similar area to my uncle - who was killed. He really was an extraordinary person, who was also very ordinary and approachable in the way he humbly carried out his work. His wealth of knowledge was huge and I always learnt something new from him. He will be missed, but with very fond memories. I have a fond memory of Colin on a tree felling task at Addiewell. I had just finished a tools talk explaining the safe use of a saw, when Colin pulled out his faithful bill hook and started felling the tree by hacking into it. I had to quickly explain to new volunteers that you only got to fell a tree in that manner if you were Colin McLean! On another a tree felling task I was struggling to saw through a piece of wood and I cursed - moderately I might add - in frustration. Colin overheard me and told me off for being 'unladylike.' He didn't like women using foul language which I took as a fair reflection of his true gentleman-like nature. Some friends of mine considered buying his house in Roslin after it was put on the market a few years back. The garden apparently was fabulous, though the inside of the house 'had potential' - not a surprise since it seems Colin's energy was all focused outside. I remember him saying he had caught three boys vandalising one of the structures inside Bawsinch and that he had put the 'fear of God' into them. I imagine that would have been quite a scary encounter in such a setting as he had quite a presence about him, and not just in physical size. I think the Lothians have lost a great and remarkable man. The local birds and beasties probably won't miss him - but they should after all he has done for them. Despite fading health he remained interested in LCV's activities and continued with his own practical conservation projects. 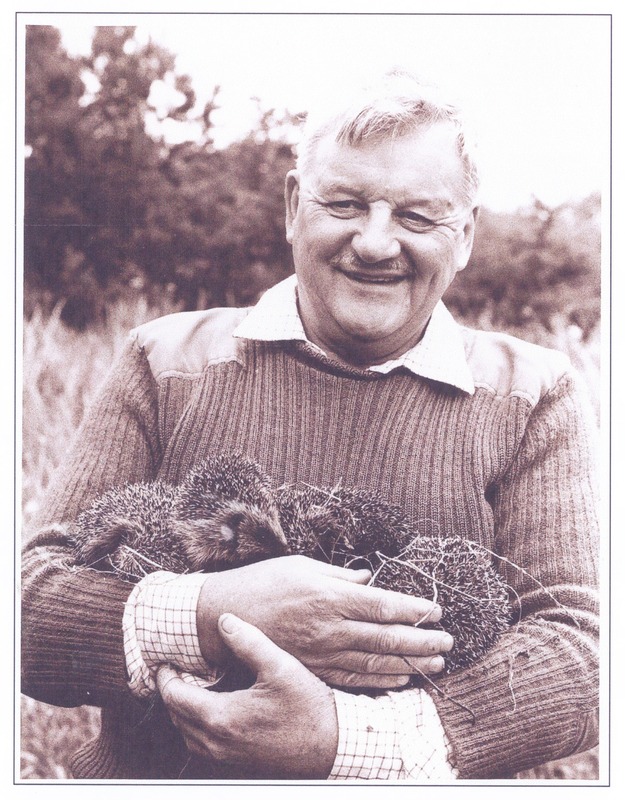 A few weeks before his death I visited him at home, only to be bustled through his house - past the photograph of him with an armful of hedgehogs: 'Ah yes, Sarah, they were sent on the plane from the Uists in a cardboard box and we released them into Bawsinch. I fear they all got eaten. ' - to his garden so that I could see the redwood seedlings he was due to plant out at Duddingston the following day. This typified his astonishing clarity of purpose and is a great example of his lasting legacy: forever taking steps to secure a future for others to enjoy. 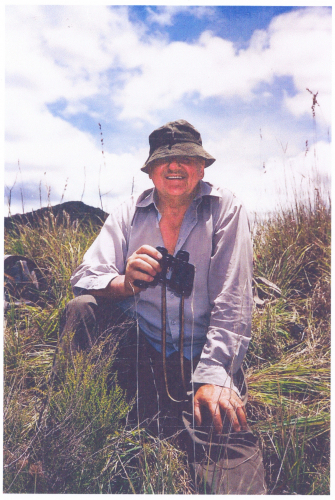 The passing of Colin McLean will sadden many who worked for wildlife conservation around Edinburgh and the Lothians. A woodsman and plantsman full of years and wisdom, with an ability to solve /resolve any problem concerning his beloved woodlands, Colin's contribution was immense. Colin Mclean was a child of his race: indomitable and determined, not likely to suffer fools gladly and yet full of warmth and humanity in good measure. Having spent many happy hours in his company working in both Bawsinch and Addiewell, I learned much about woodland management and how to make much with little. Always a joy to be with, I shall miss him greatly as will those who love nature and had the pleasure of spending some time in his company. ...and motivating us well past the Millenium. Kate and I were sorry to hear about Colin, he was a real inspiration, the bill hook always hanging at his side into his eighties. We have one little tale from about six years ago. "These Oregon pines were planted in 1948." "Surely those are Douglas firs?" "That's the species yes, but they are pine trees and I bought them in Oregon myself!" When I joined LCV in July 2005 at - what I considered - the pretty advanced age of twenty-six, Colin was eighty-four. It says a great deal for Colin's ongoing enthusiasm, love of life and commitment to LCV that I met him at all, and still more that he was an active presence until weeks before his passing. So, what are my memories of Colin? Well, in truth, they're not dramatic. I remember watching him sit down on the ground to eat his sarnies at Addiewell one day and thinking that if I could still do that in 2065 I'd be well chuffed. I remember him sharing his birthday cake with us at Bawsinch just after his ninetieth birthday. I remember sending him a few photos of LCV in action at Addiewell not long after he'd had to give it up and getting a lovely note in response with news of how the willow warblers were doing. Small things, but part of what LCV is for me and, I hope, part of what LCV was for Colin. In fact, as one of the last LCV Co-ordinators to have had the opportunity to meet one of LCV's most important founding members in person, I consider myself privileged. I've heard it said that you are never truly an adult until you lose your parents. If so there is now no excuse at all for LCV not to get out there and carry on keeping up what Colin started! And the last word comes from Colin himself. Reprinted here is his ode to LCV which he penned for our fortieth anniversary in 2010. Sing it to the tune of "Nicky Tams" a well-known North East bothy ballad. When I was rising fifty years, I joined SWT. Or stickin' in the shrubs and trees of which I was sae fond. Safe hames for flooers, birds and beasts, afore it's a' too late. Good luck, long life and many thanks tae the Conservation Corps!